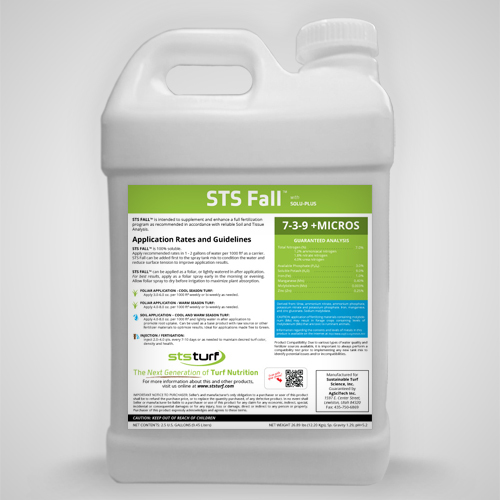 STS Fall 7-3-9 promotes a specific balance of both macro, and micronutrients, which will assist in optimizing fall re-root initiation, carbohydrate production, shorter days, lower light intensity, and transitioning to colder temperatures and/or dormancy. The stronger your turf goes into winter, the stronger you come out in the spring. STS Fall 7-3-9 delivers 13 of the 16 essential nutrients. Included is our Nutrient Mining Technology™, Solu-Plus, which plays a key role in assisting nutrients into the plant, and preventing restrictions along the way. Our proprietary natural plant and fermentation extracts work synergistically to assist with rooting, chlorophyll production, and drought tolerance. Other components of STS Fall include organic compounds, amino, humic and fulvic acids, carbohydrates, plant defense elicitors and anti-oxidants.